Edited by: Hengl T. & Sanderman J. Plant and animal residues at various stages of decomposition (organic matter). Xu, Thornton, and Post (2013) estimated that total global microbial biomass is about 17 Pg C, which is only about 2% of the total for organic matter. Therefore, the amounts of C in microbial biomass can reasonably be considered negligible, in comparison to the total C stock. However, if one includes all living organisms, and especially tree roots, then the portion of total C found in living organisms could be more significant, especially in areas under dense forests. While OCS is a summary measure of SOC, always associated with a specific depth interval, OCD is a relative measure of soil organic carbon distribution and can be associated with any support size i.e. to an arbitrary depth. In principle, OCD (kg/m\(^3\)) is strongly correlated with ORC (g/kg) as indicated in the figure below. However, depending on soil mineralogy and coarse fragment content, OCD can be lower or higher than what the smoothed line indicates (notice the range of values around the smoothed line is relatively wide). It is important to understand, however, that, as long as ORC, BLD and CRF are known, one can convert the values from ORC to OCD and OCS and vice versa, without loosing any information about the soil organic carbon stock. 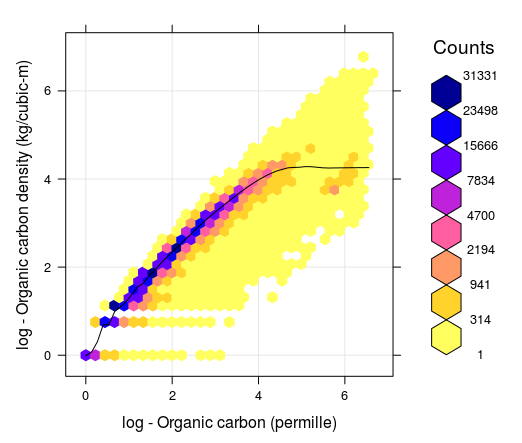 Figure 7.1: Correlation between soil organic carbon density and soil organic carbon content (displayed on a log-scale) created using a global compilations of soil profile data (WoSIS). Values 1, 2, 3, 4, 5 and 6 in the plot (log scale) correspond to values 2, 6, 19, 54, 147 and 402. Note that for ORC >12 percent, the OCD line flattens, which means that, organic carbon density practically stops to increase with the increase of ORC content. Global estimates of the total soil organic carbon stock are highly variable (Scharlemann et al. 2014). Current estimates of the present total soil organic carbon stock (excluding peatlands) range between 800–2100 Pg C (for 0–100 cm), with a median estimate of about 1500 Pg C (for 0–100 cm). This means that the average OCS for the 0–100 cm depth interval for the global land mask (148,940,000 km\(^2\)) is about 11 kg/m\(^2\) or 110 tons/ha, and that average soil organic carbon density (OCD) is about 11 kg/m\(^3\) (compare to the standard bulk density of fine earth of 1250 kg/m\(^3\)); standard OCS for 0–30 cm depth interval is 7 kg/m\(^2\) i.e. the average OCD is about 13 kg/m\(^3\). The average Organic Carbon Stock for the 0–100 cm depth interval (mineral soils) is about 11 kg/m\(^2\) or 110 tons/ha. The average soil Organic Carbon Density (OCD) is about 11 kg/m\(^3\) (compared to the standard bulk density of fine earth of 1250 kg/m\(^3\)). Standard Organic Carbon Stock for 0–30 cm depth interval is 7 kg/m\(^2\) i.e. the average OCD is about 13 kg/m\(^3\). The distribution of soil organic carbon in the world is, however, highly patchy with large areas with OCS \(\ll 100\) tons/ha, and then some pockets of accumulated organic material i.e. 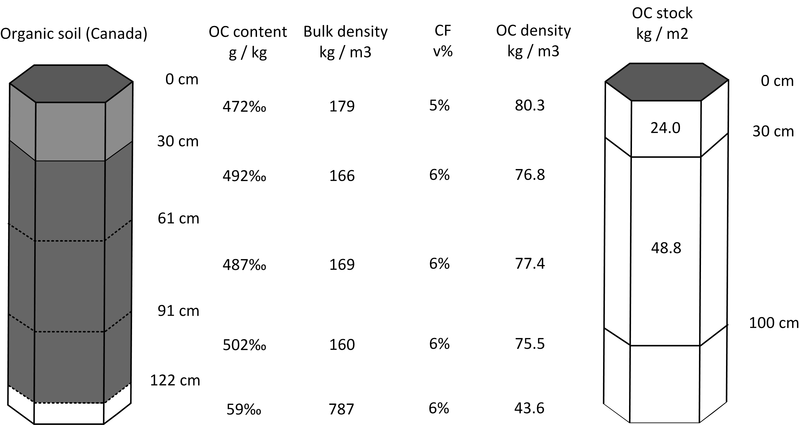 organic soil types (histosols) with OCS up to 850tons/ha (for 0–30 cm depth interval). The world’s soil organic matter accumulation areas are usually found in the following biomes / land cover classes: wetlands and peatlands, mangroves, tundras and taigas. Land use and agriculture, in particular, have led to dramatic decreases in soil carbon stocks in last 200+ years (agricultural and industrial revolutions). Lal (2004) estimated that approximately 54 Pg C have been added to the atmosphere due to agricultural activities with another 26 Pg C being lost from soils due to erosion. Wei et al. (2014) estimated that, on average, conversion from forests to various agricultural land results in a 30–50% decrease in SOCS. Modelling and monitoring of soil organic carbon dynamics is therefore of increasing importance (see e.g. FAO report “Unlocking the Potential of Soil Organic Carbon”). 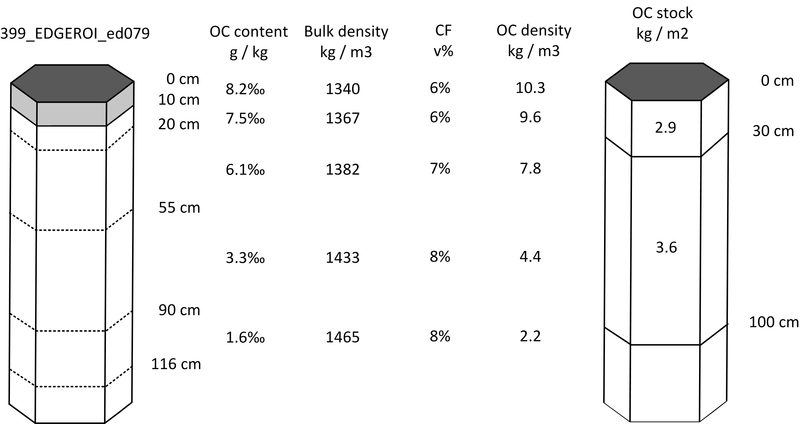 As mentioned previously, OCS stock is most commonly derived from measurements of the organic carbon (ORC) content, soil bulk density (BLD) and the volume fraction of gravel (CRF). These are usually sampled either per soil layers or soil horizons (a sequence of horizons makes a soil profile), which can refer to variable soil depth intervals i.e. are non-standard. That means that, before one can determine OCS for standard fixed depth intervals (e.g. 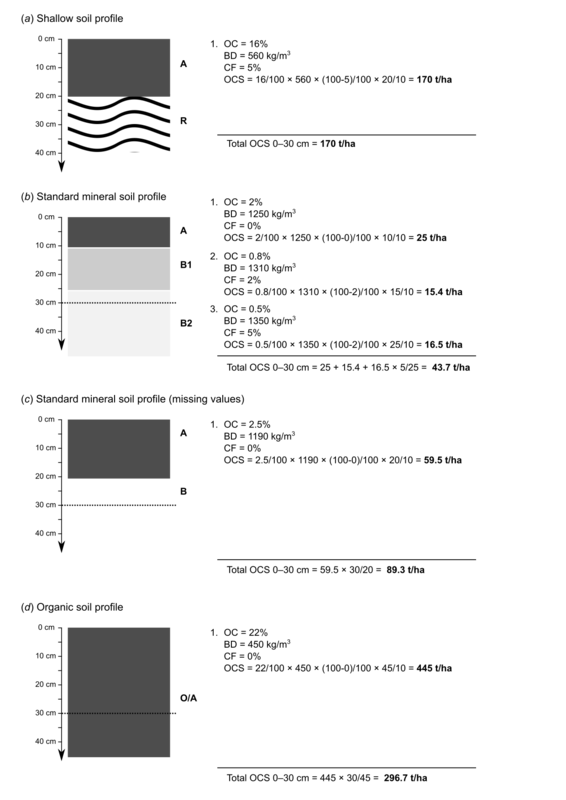 0–30 cm or 0–100 cm), values of ORC, BLD and CRF need to be standardized so they refer to common depth intervals. Consider, for example, the following two real life examples of soil profile data for a standard agricultural soil and an organic soil. For example the profile from Australia (Karssies 2011), which is shown in Tbl. 7.1. Note the original soil profile description / laboratory data indicates that no BLD were recorded for this profile. In the absence of measured field BLD we can substitute BLD estimated using LandGIS data. It (unfortunately) commonly happens that soil profile observations lack BLD measurements, and consequently BLD needs to be generated using a Pedo-Transfer function or estimated from soil maps. Table 7.1: Laboratory data for a profile 399 EDGEROI ed079 from Australia (Karssies 2011). id = "399_EDGEROI_ed079"; TIMESTRR = "1987-01-05"
Values of OCS between 5–35 kg/m\(^2\) for 0–100 cm are commonly reported for a variety of mineral soils with e.g. 1–3% of soil organic carbon. Organic Carbon Stock for standard depths can be determined from legacy soil profile data either by fitting a spline function to organic carbon, bulk density values, or by aggregating data using simple conversion formulas. A standard mineral soil with 1–3% soil organic carbon for the 0–100 cm depth interval should have about 5–35 kg/m\(^2\) or 50–350 tonnes/ha. An organic soil with >30% soil organic carbon may have as much as 60–90 kg/m\(^2\) for the 0–100 cm depth interval. The measurement error is computed from default uncertainty values (expressed in standard deviations) for organic carbon (10 g/kg), bulk density (100 kg/m\(^3\)) and coarse fraction content (5%). When these are not provided by the user, the outcome should be interpreted with care. Figure 7.2: Determination of soil organic carbon density and stock for standard depth intervals: example of a mineral soil profile from Australia. In the second example we look at a profile from Canada (a histosol with >40% of organic carbon; Shaw, Bhatti, and Sabourin (2005)) which is shown in Tbl. 7.2. Table 7.2: Laboratory data for an organic soil profile from Canada (Shaw, Bhatti, and Sabourin 2005). which gives slightly lower bulk density values. Another useful source for PTFs for organic soils is work by Hossain, Chen, and Zhang (2015). For illustrative purposes, we have here used only one PTF for all soil layers. 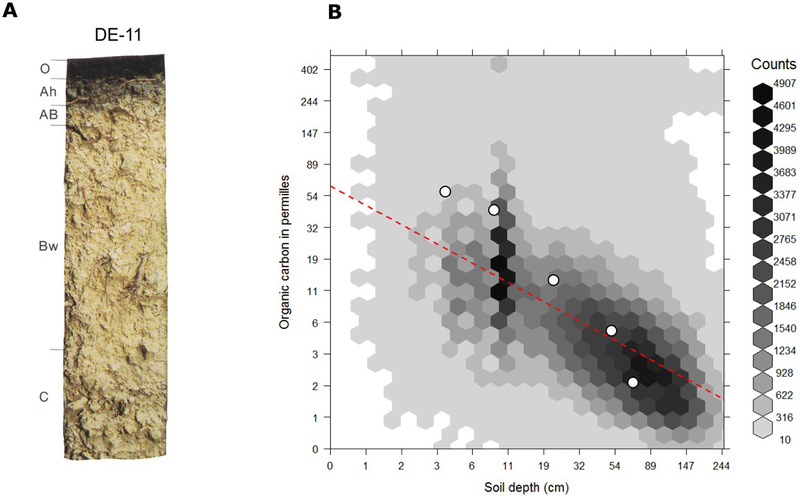 Figure 7.3: Determination of soil organic carbon density and stock for standard depth intervals: example of an organic soil profile from Canada. Only 3–4% of the total soil profiles in the world have organic carbon content above 8% (soils with ORC >12% are classified as organic soils or histosols in USDA and/or WRB classifications and are even less frequent), hence soil-depth functions of organic carbon content and derivation of OCS for organic soils are specific for patches of organic soils. On the other hand, organic soils carry much more total OCS. Precise processing and mapping of organic soils is, therefore, often crucial for accurate estimation of total OCS for large areas. Therefore, it is fairly important to use a good PTF to fill in missing values for BLD for organic soils. As a rule of thumb, organic soil will rarely exhibit a density greater than some minimum value e.g. 120 kg/m\(^3\) because even though SOC content can be >50%, bulk density of such soil gets proportionally lower and bulk density is physically bound with how material is organized in soil (unless soils is artificially compacted). Also, using correct estimates for coarse fragments is important as otherwise, if CRF is ignored, total stock will be over-estimated (Poeplau, Vos, and Axel 2017). Aggregate non-standard horizon depth values using some simple rules (Fig. 7.4). Figure 7.4: Estimation of OCS values 0–30 cm using some typical soil profile data without fitting splines. #> Growing trees.. Progress: 86%. Estimated remaining time: 5 seconds. This gives about 30% lower value than the random forest-based PTF from above. Over-estimating BLD will always result in higher OCS, hence clearly accurate information on BLD can be crucial for any OCS monitoring project. This means that the PTF fitted using random forest above is likely over-estimating BLD values for organic soils, mainly because there are not enough training points in organic soils that have measurements data for all of ORC, BLD, soil pH and texture fractions (if ANY of the calibration measurements are missing, the whole horizons are taken out of calibration and hence different ranges of BLD could be completely misrepresented). Soil Bulk density (BLD) is an important soil property that is required to estimate stocks of nutrients especially soil organic carbon. Measurements of BLD are often not available and need to be estimated using some PTF or similar. Most PTF’s for BLD are based on correlating BLD with soil organic carbon, clay and sand content, pH, soil type and climate zone. 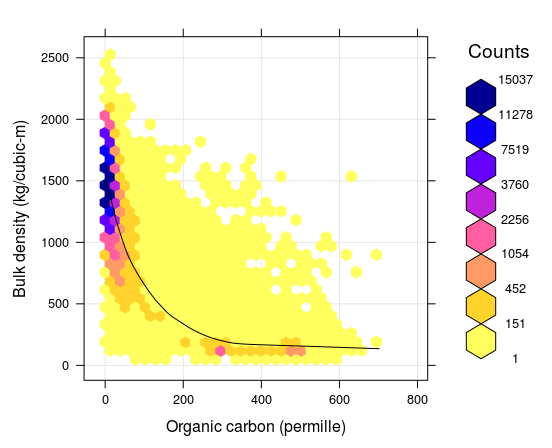 Figure 7.5: Correlation plot between soil organic carbon density and bulk density (fine earth), created using the global compilations of soil profile data (http://www.isric.org/content/wosis-data-sets). Black line indicates fitted loess polynomial surface (stats::loess). There is still quite some scatter around the fitted line: many combinations of BLD and ORC, that do not fall close to the correlation line, can still be observed. To fill-in missing values for BLD, a combination of two global Pedo-Transfer functions can be used for example: (1) PTF fitted using random forest model that locally predicts BLD as a function of organic carbon content, clay and sand content, pH and coarse fragments, and (2) a simpler model that predicts BLD based on only ORC. The average RMSE of these PTFs for BLD is about ±150 kg/m\(^3\). This also illustrates that any organic carbon spatial prediction model can significantly profit from including depth in the statistical modelling. Figure 7.6: Globally fitted regression model for predicting soil organic carbon using depth only (log-log regression) and (a) individual soil profile from the ISRIC soil monolith collection. Image source: Hengl et al. (2014) doi: 10.1371/journal.pone.0105992. In summary, PTFs can be used to efficiently estimate missing BLD values (BLD is usually highly correlated with organic carbon content and depth, texture fractions, soil classification and soil pH can also help improve accuracy of the PTFs). However, for organic soils there is, in general, less calibration data and therefore errors are potentially higher. Mistakes in estimating BLD can result in systematic and significant over/under-estimations of the actual carbon stock. On the other hand, removing all soil horizons from OCS assessment that lack BLD measurements leads also to reduced accuracy as fewer points are then available for training of the spatial prediction models. Especially for organic soils (>12% organic carbon), there is no easy solution for estimating missing values for BLD. Collecting additional (local) calibration points might become unavoidable. Lobsey and Viscarra Rossel (2016) recently proposed a method that combines gamma-ray attenuation and visible–near infrared (vis–NIR) spectroscopy to measure bulk density ex situ using samples that are freshly collected under wet field conditions. Hopefully unreliable, or missing, BLD measurements will become less of a problem in the future. Most projects focused on monitoring OCS require an estimate of OCS to be provided for the entire area of interest, so that users can visually explore spatial patterns of OCS. 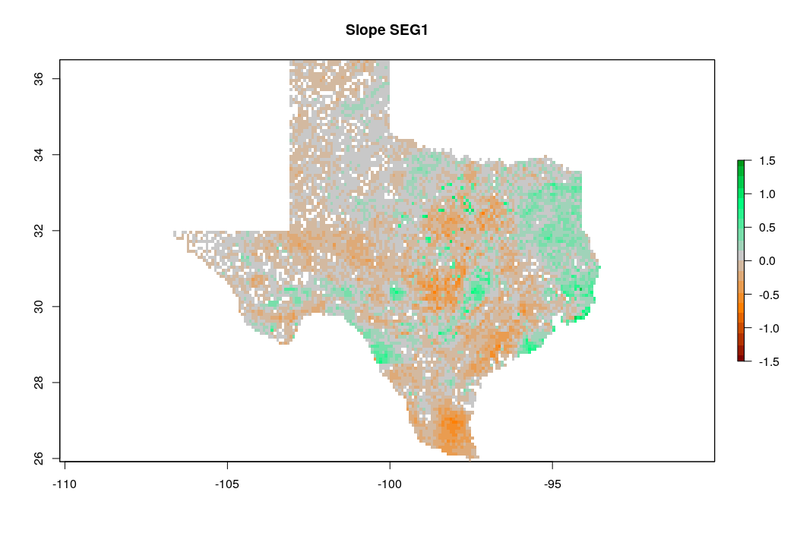 In this tutorial we demonstrate how to generate maps of OCS using point samples and RS based covariates. The output of this process is usually a gridded map (SpatialPixelsDataFrame) covering the entire area of interest (plot, farm, administrative unit or similar). Once OCS is mapped, we can multiply OCS densities by the area of each pixel and summing up all numbers we can compute the total OCS in total tonnes using the formula above. 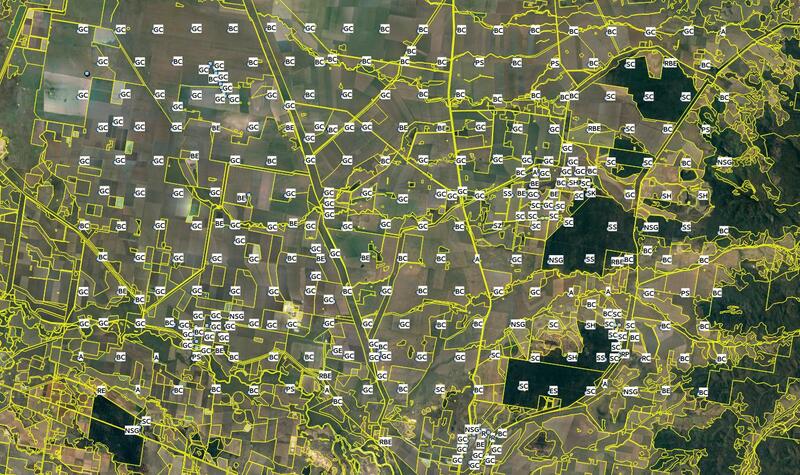 Predicted OCS values can also be aggregated per land cover class or similar. If a series of OCS maps is produced for the same area of interest (time-series of OCS), these can then be used to derive OCS change through time per pixel. 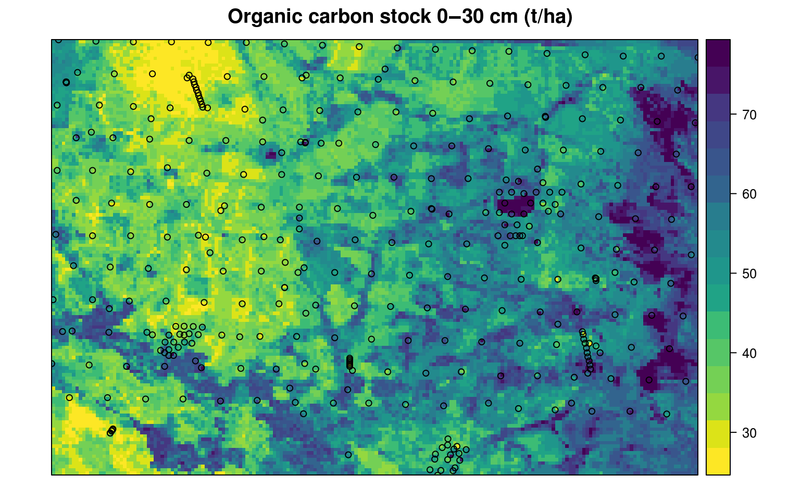 Soil Organic Carbon stock can be mapped by using at least three different approaches: (1) the 2D approach where estimation of OCS is done at the site level, (2) the 3D approach where soil organic carbon content, bulk density and coarse fragments are mapped separately, then used to derive OCS for standard depths at each grid cell, and (3) the 3D approach based on mapping Organic Carbon Density, then converting to stocks. Figure 7.7: Three main computational paths (2D and 3D) to producing maps of organic carbon stock. A disadvantage of doing 3D modeling of OCD is, however, that correlation with covariate layers could be less clear than if separate models are built for ORC, BLD and CRF. Because OCD is a composite variable, it can often be difficult to distinguish whether the values are lower or higher due to differences in ORC, BLD or CRF. We leave it to users to compare various approaches to OCS mapping and then select the method that achieves the best accuracy and/or is most suitable for use for their applications. proj4string(COSha30map) = "+proj=utm +zone=18 +ellps=WGS84 +datum=WGS84 +units=m +no_defs"
which shows predictions and kriging variances for COSha30. Figure 7.8: Example of a data set with OCS samples (for 2D prediction). Case study in Colombia available via the geospt package (https://cran.r-project.org/package=geospt). #> RMSE was used to select the optimal model using the smallest value. #>  maxstat and min.node.size = 20. #>  and subsample = 1. This example illustrates that no significant spatial prediction models (with an R-square exceeding 10%) can be fitted using these data. 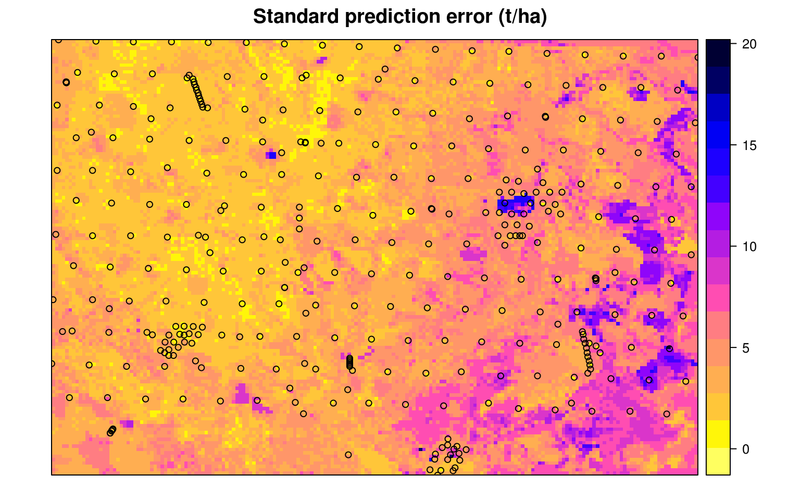 It is very common in soil mapping projects for models to explain only low amounts of the total variation, resulting in large average errors of prediction and/or wide prediction intervals. This can occur because of high measurement errors, and/or because there are missing covariates, but it could also happen because the natural complexity of soils in the area is simply high. Note that the absolute values of our predictions of OCS are somewhat different than those produced by the geospt package authors, although the main patterns are comparable. Figure 7.9: Comparison of predictions generated using ordinary kriging (left) and machine learning with the help of 30 m resolution covariates and buffer distances (right). In the following example, we will demonstrate, using a well known data set, (Edgeroi, from Australia) which has been well documented in the literature (Malone et al. 2009), how to derive OCS in t/ha using soil profile data and a 3D approach to spatial prediction based on mapping the Organic Carbon Density (OCD) in kg/m-cubic. The Edgeroi data set is a typical example of a soil profile data set that is relatively comprehensive, but still missing BLD measurements. Figure 7.10: Edgeroi data set: locations of soil profiles and Australian soil classification codes. For more details see Malone et al. (2009). #>  "DEMSRT5" "TWISRT5" "PMTGEO5" "EV1MOD5" "EV2MOD5" "EV3MOD5"
The Edgeroi completely lacks any BLD values, therefore before we can compute OCD values, we need to estimate BLD values for each corresponding horizon. Here the easiest option is probably to use BLD values sourced from LandGIS predictions (and which you can download from https://landgis.opengeohub.org). This shows that OCD values range from 0–110 kg/m-cubic, with an average of 9.5 kg/m-cubic (this corresponds to an average organic carbon content of about 0.8%). Which shows that the average error with Out-of-bag training points is ±4.2 kg/m-cubic. Note that setting quantreg = TRUE allows us to derive also a map of the prediction errors (Fig. 7.11), following the method of Meinshausen (2006). #>    Min. 1st Qu. Median    Mean 3rd Qu. Max. Figure 7.11: Predicted organic carbon stock for 0–30 cm depth for the Edgeroi data set. All values expressed in tons/ha. Figure 7.12: The prediction error map for the Edgeroi data set. 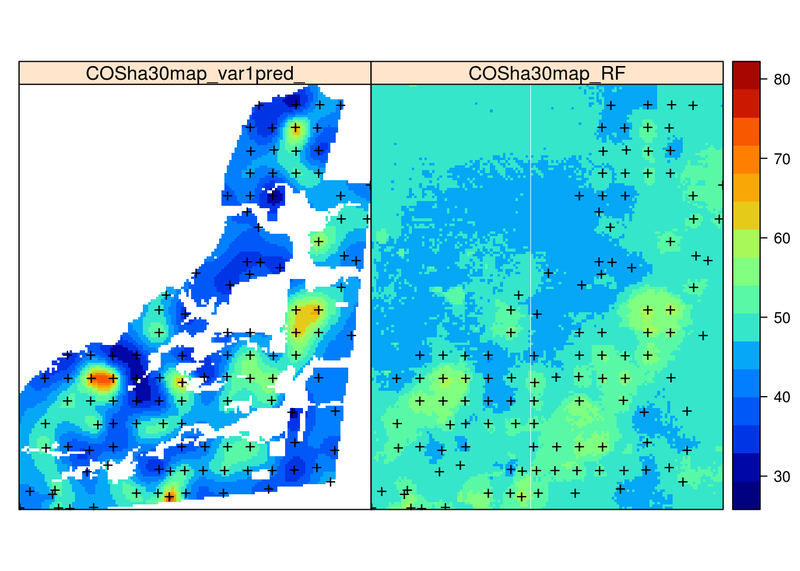 Note that deriving the error map in the ranger package can be computationally intensive, especially if the number of covariates is high, and is therefore not yet recommended for large rasters. Which shows that, for the Cropping - continuous or rotation, which is the dominant land use class in the area, the average OCS is 43 tons/ha for the 0–30 cm depth. In this case, the total soil organic carbon stock for the whole area (for all land use classes) is ca 7154 thousand tons of C. There do not appear to be large differences in OCS between the natural vegetation and croplands. 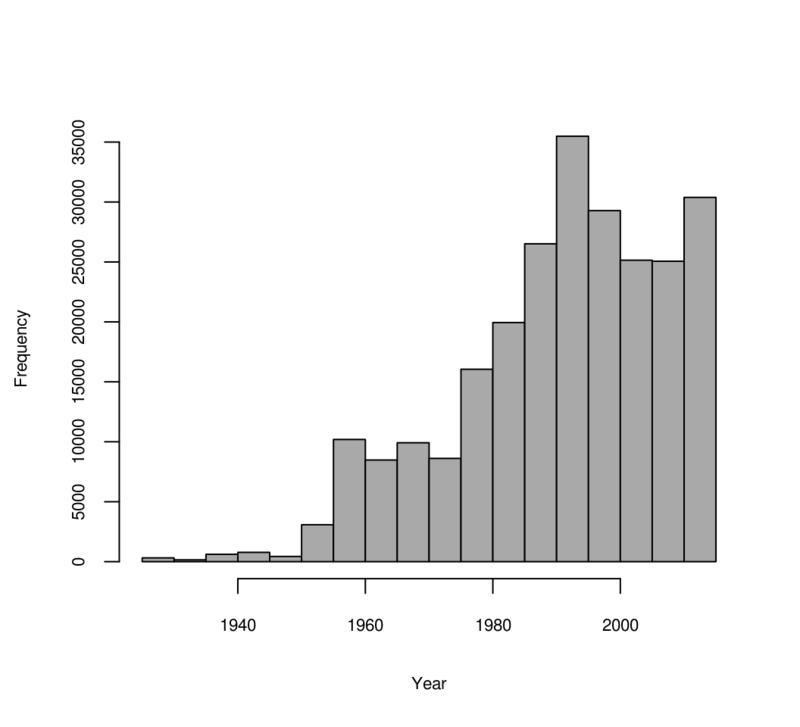 Figure 7.13: Distribution of soil observations based on sampling year. HYDE 3.2 Historic land use data set (Klein Goldewijk et al. 2011): portrays the distribution of major agricultural systems from 10,000 BC (pre-historic no land-use condition) to the present time. 10 categories of land use have been represented: total cropping, total grazing, pasture (improved grazing-land), rangeland (unimproved grazing-land), total rainfed cropping, total irrigated cropping, with further subdivisions for rice and non-rice cropping systems for both rainfed and irrigated cropping. CRU TS2.1 climatic surfaces for period 1960–1990 (Harris et al. 2014). UNEP-WCMC Generalized Original and Current Forest cover map showing global dynamics of forest cover. which shows that the most important soil covariate by far is soil depth, followed by elevation, grazing, MODIS cloud fraction images, cropland and similar. For a full description of codes please refer to Sanderman, Hengl, and Fiske (2018). Finally, based on this model, we can generate predictions for 3–4 specific time periods and for some arbitrary depth e.g. 10 cm. The maps below clearly show that ca 8% of soil organic carbon has been lost in the last 90 years, most likely due to increases in grazing and croplands. The maps also show, however, that some areas in the northern latitudes are experiencing an increase in SOC, possibly due to higher rainfall i.e. based on the CRU data set. Figure 7.14: Predicted OCD (in kg/cubic-m) at 10 cm depth for the year 2014. Blue colors indicate low values, red high values. Figure 7.15: Predicted OCD (in kg/cubic-m) at 10 cm depth for the year 1925. This demonstrates that, as long as there is enough training data spread through time, and as long as covariates are available for the corresponding time ranges, machine learning can also be used to fit full 3D+T spatiotemporal prediction models (Gasch et al. 2015). Once we produce a time-series of images for some target soil variable of interest, the next step would be to implement time-series analysis methods to e.g. detect temporal trends and areas of highest apparent soil degradation. An R package that is fairly useful for such analysis is the greenbrown package, primarily used to map and quantify degradation of land cover (Forkel et al. 2015). 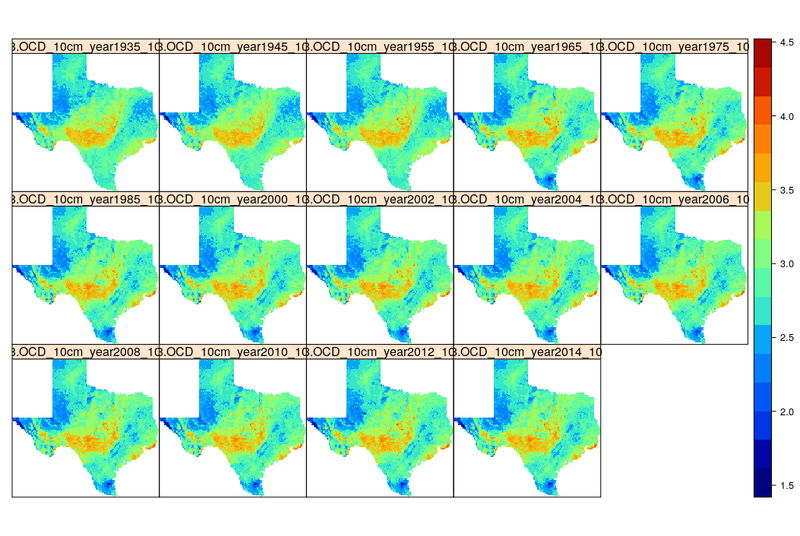 Figure 7.16: Time-series of predictions of organic carbon density for Texas. Figure 7.17: Predicted slope of change of soil organic carbon density for Texas for the period 1935–2014. Negative values indicate loss of soil organic carbon. 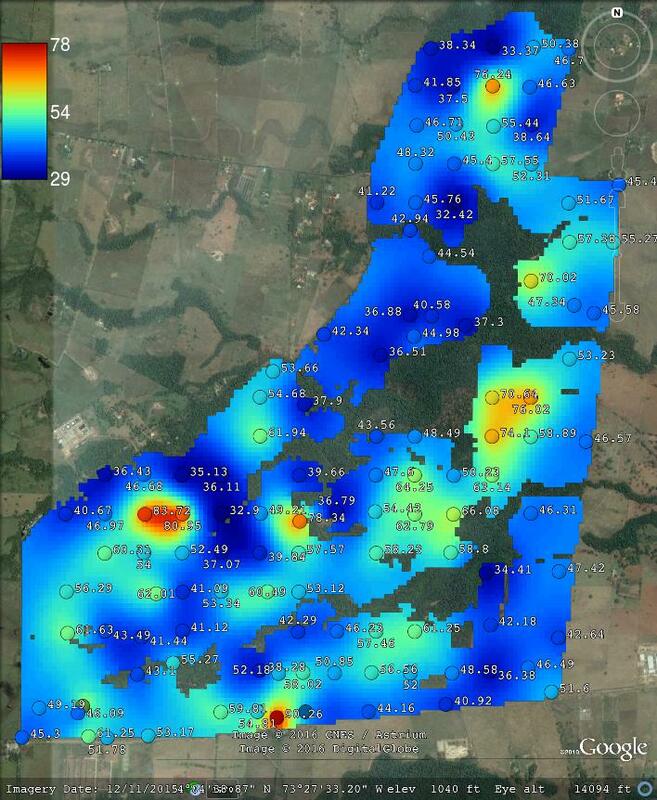 which shows that loss of soil organic carbon is especially distinct in the southern part of Texas. The slope coefficient map is, on average, negative, which indicates that most of the state has lost organic carbon for the period of interest. Note that running such time-series analysis is not trivial as a sufficient number of observations in time (if possible: repetitions) is needed to be able to extract significant patterns. Also TrendRaster function can be quite computationally intensive, hence some careful planning of the processing steps / processing infrastructure is usually recommended. OCS for an area of interest can be derived either using 2D or 3D approaches. 3D approaches typically include modeling ORC, BLD and CRF separately (and then deriving OCS per pixel), or modeling OCD for standard depths and then converting to OCS. Publicly available RS-based covariates (SRTM / ALOS DEM, Landsat, Sentinel satellites) are available for improving the mapping accuracy of OCS. Improving the accuracy of OCS maps is becoming less expensive, given the increasing availability of RS data. PT (Pedo-Transfer) rules can be used to fill in (estimate) missing BLD values and to estimate ORC for deeper soil depths. Also global maps with predictions of BLD and CRF can be used to supply missing values, if there are no other alternatives. 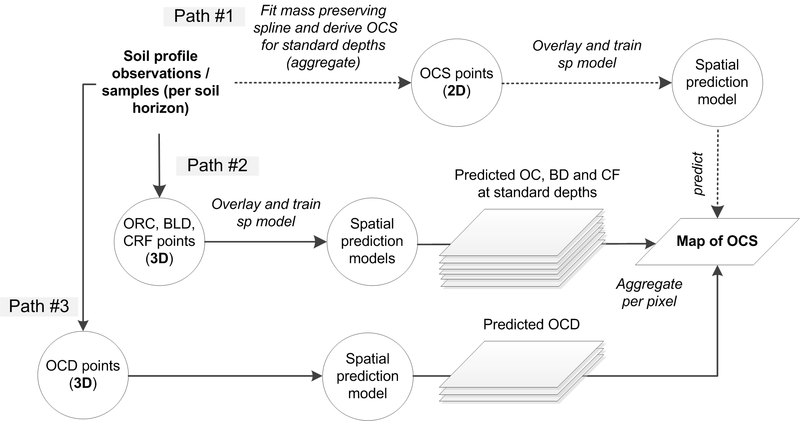 Machine learning techniques such as Random Forest, neural nets, gradient boosting and similar, can be used to predict soil organic carbon in 2D, 3D and in spatiotemporal modeling frameworks. The accuracy of these predictions is improved relative to linear statistical models, especially where the relationship between soil organic carbon distribution and climatic, land cover, hydrological, relief and similar covariates is complex (i.e. non-linear). Global estimates of ORC, BLD and CRF can be used as covariates so that consistent predictions can be produced (as explained in Ramcharan et al. (2018)). By producing spatial predictions of OCS for specific time periods, one can derive estimates of OCS change (loss or gain). Most of the statistical / analytical tools required for running spatial analysis, time series analysis, export and visualization of soil carbon data are available in R, especially thanks to the contributed packages: aqp, caret, ranger, xgboost, GSIF, greenbrown and similar. Accurate measurements of bulk density (BLD) by horizon or depth interval for described soil profiles are critical for producing accurate calculations of soil carbon stock. Unfortunately, BLD data are often missing or not reported for many legacy soil profile descriptions and are frequently unreliable even when reported. Future efforts to sample and describe soil profiles should emphasise the collection and publication of accurate measurements of BLD by horizon or depth interval for all described soil profiles.